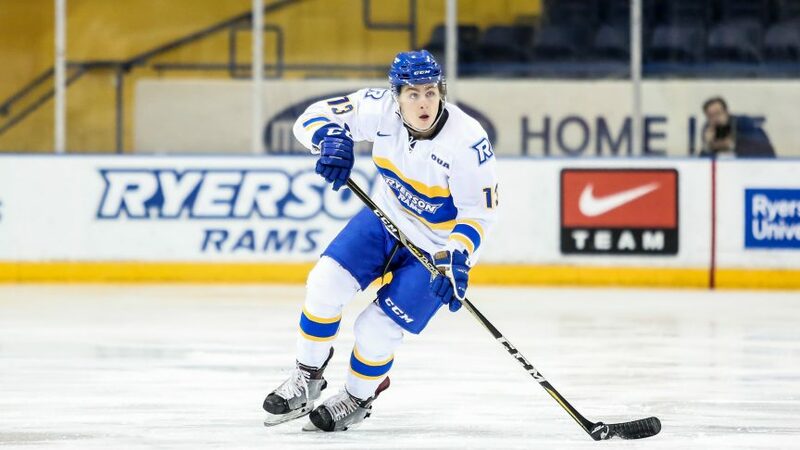 In the first of their last two-game homestand of 2018, the Ryerson Rams men’s hockey team had their seven-game winning streak snapped, losing 5-4 against the Toronto Varsity Blues on Nov. 29. The Rams, riding a blistering seven-game win streak, hoped to continue their roll against a middling Varsity Blues team, who entered Thursday’s tilt with a 4-11 record. Unfortunately for the home team, U of T managed to withstand the team’s early offensive attack and comeback from a 3-0 deficit. “We had a tough time in the second period,” said Rams forward Matt Mistele. To start the game, Ryerson took an early lead thanks to the stellar stick work of forward Cavin Leth to put the game at 1-0. The Rams added two more in the frame, with their second goal of the contest coming from Devon Paliani and the third coming from the OUA scoring leader Mistele. Following a physical exchange in front of the Toronto bench, Evan MacEachern got the Varsity Blues on the board with a slick tip in front of Rams goalie Garrett Forrest. U of T’s success didn’t stop there, as a goal from winger Louis Kereakou put the game at 3-2 at the end of the first period. Unable to capitalize on opportunities, Ryerson found themselves on the back end of another offensive attack in the middle of the second period. In the frame, the Blues would add the equalizer on a beautiful deke and finish from Ryan Kirkup. Minutes later, goals from Kevin Lavoie and Matt Heffernan gave the underdog a two-goal lead heading into the third. A last-second goal in the final frame from fifth-year forward John Carpino would cut the lead to one. But it ended up being too late, as the Varsity Blues managed to keep the OUA West-leading Rams at bay for the remainder of the game. UP NEXT: The Rams will look to bounce back in their final game of 2018 against the Brock Badgers at Mattamy Home Ice on Dec. 1. Puck is scheduled for 7:15 p.m.